At PenFed's 2018 Night of Heroes Gala, a D.C.-area vet was recognized as the military honoree for distinguished service in Operation Enduring Freedom and for his efforts to inspire other veterans after returning home as a double amputee. WASHINGTON — Usually, when you donate money you likely won’t meet who you’re helping. But a D.C.-area veteran who has gotten a helping hand wants the world to know he is grateful. “I got a Segway chair last year, and I have to tell you: It’s a game changer,” said retired U.S. Army Master Sgt. Cedric King. The custom-made Segway chair he received was donated by the PenFed Foundation. “You come home, and you don’t want to walk on your [prosthetic] legs. These legs are painful. They’re useful, but they’re painful,” King said. He lost a portion of both legs when he was gravely injured in Afghanistan and arrived at Walter Reed National Military Medical Center in a coma. Twenty-one months later, he recovered enough to run the Boston Marathon. At PenFed’s 2018 Night of Heroes Gala, King was recognized as the military honoree for distinguished service in Operation Enduring Freedom and for his efforts to inspire other veterans after returning home as a double amputee. The gala’s theme this year was centered around service dogs. “A lot of folks with PTSD have a tough time reintegrating into the community. Service dogs are a game changer,” said PenFed Credit Union President and CEO James Schenck. 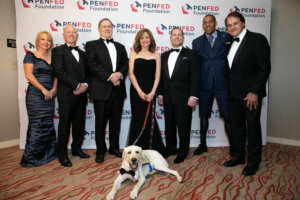 The PenFed Foundation donated $150,000 of the money raised at the gala to three organizations that train service dogs for veterans: Canine Companions for Independence, Leashes of Valor and the Animal Rescue Foundation. National Baseball Hall of Famer Tony La Russa is co-founder of Animal Rescue Foundation and its Pets and Vets program. He was at the gala to receive the Community Honoree Award for helping military families with donations of service dogs to veterans. In its 14th year, the gala raised a record amount of money: more than $2.5 million. “Every single dollar goes to our programs to help active duty military, their families, veterans or their caregivers. We’re very proud of that, and our donors are proud of that,” Schenck said. “PenFed Credit Union covers 100 percent of the operating costs of the foundation,” he added. The PenFed Foundation’s newest initiative, the Veteran Entrepreneur Investment Program, got a jump start at the gala with a $500,000 surprise donation from Allied Solutions at the event. 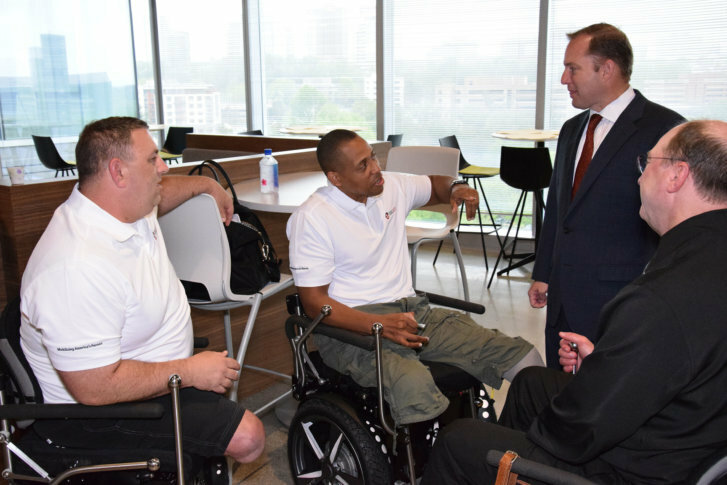 “We’re in the process of raising $2 million to provide seed capital to veterans getting out of the service who want to launch their own business,” Schenck said. King, the retired master sergeant, now has his own company teaching leadership and teamwork to Fortune 500 companies. But he believes the most important thing he does is “giving back” and working to help and inspire other veterans.